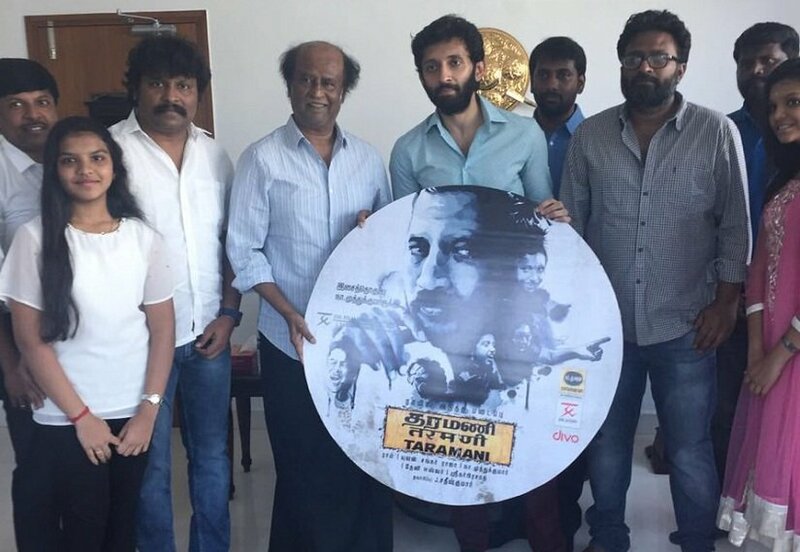 India's top Actor Superstar Rajinikanth released songs of director ram's upcoming movie "Taramani". This is very surprising to the audience as well Kollywood industry, why because normally Rajinikanth is very careful and maximum he isn't attending event function in cinema industry except one or two. In fact, he wasn't even present for the audio launch of his own film, Kabali, earlier in 2016. Now, Superstar Rajinikanth released audio for Taramani movie at his residence in Poes Garden, Chennai. It is very rare for the superstar to launch the audio of a Tamil film. Director Ram previously directed very amazing as well unique movies like Kattradhu Thamizh, Thanga Meengal, these got national awards. Ram's Taramani movie story based on IT couple relationship, produced by J. Satish Kumar and Ram's production company Catamaran Productions. Vasanth Ravi and Andrea Jeremiah done the lead role, background music scored by Yuvan Shankar Raja. Taramani distribution rights got by JSK Film Corporation. As a tribute to late legendary lyricist Na Muthukumar, the team TARAMANI has released an exclusive video on Youtube recently, and that video titled as 'From the Bottom of Our Hearts' has gone viral among the Audience within few minutes. Produced by J Satish Kumar of JSK Film Corporation and Directed by Ram, the Urban - Romantic - Tale TARAMANI has the scintillating music of Yuvanshankar Raja. The music album of TARAMANI, a tribute to Na Muthukumar, was released by Superstar Rajnikanth on 30th December, 2016. Director Ram visibily excited on getting the album released by the Super Star said Quoted: " We are glad with the recognisation we got for our efforts from Rajini sir. At the same time my heart bleeds for my friend and soul mate Na Muthukumar. More than 1500 songs and Two National awards, Na Muthukumar ruled as a King in Tamil Film Industry for more than ages by his heart skipping lyrics. TARAMANI will never be his last ...as far as we are concerned he lives eternally in words . Yuvanshankar Raja Quoted: "Na Muthukumar's lines has given me a drastic change in my Music Career. 'From the Bottom of Our Hearts' we dedicate our TARAMANI album to my best partner Na Muthukumar." Write & Share about "Superstar Rajinikanth released Ram's Taramani Audio Songs | Taramani Tamil Movie News | Cinema Profile" !